Stop the state atrocities on the peaceful protesters in Tamil Nadu! The historic upsurge of the students and the youth which displayed a great show of solidarity, and reflected the aspirations of the significant sections of the Tamil community across the world, to pursue the struggle against the high handed ban against Jallikattu is now brutally suppressed by the state forces. 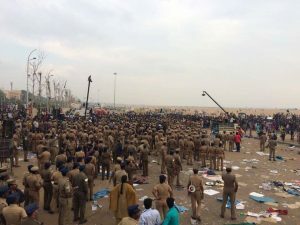 From the early hours today the police started evicting the protesters who were peacefully campaigning in the Marina beach for nearly a week’s time. There were families with women and children as well. The protesters who were in an organised and disciplined manner coordinated that huge demonstration and the various activities in the week long occupation of hundreds and thousands of protesters in the Marina beach were not given the time or even the chance to make the decision on the state imposed order for immediate eviction. 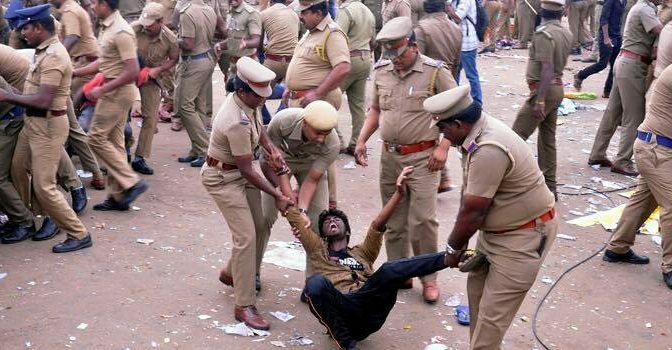 Protesters in Madurai and Coimbatore were also brutally handled, and being evicted by the police. The students and youth were forced to evict and those who resisted were severely beaten with lathis (batons) by the police. Many injured and several protesters were detained. Police used tear gas to assault the crowd and stopped the supply of food and water to the site. This is a well planned state response against student’s and youth movement infringing the rights of the people to protest in-order to take a stand against the establishment. This is an atrocious insult against the sentiments of a lot of people and communities who took pride in this massive struggle for their identity and culture. This is also a serious assault against the morale of all those activists who are continuously fighting against all kinds of oppression. purushottam.dass@gov.in to register our complaints about the violence against the ordinary protesters. Let’s condemn the state oppression against the legitimate rights to assemble and protest! Release all those detainees and the state should provide treatment, adequate compensation for those who are injured! No charges of any kind should be imposed on those activists and campaigners! Support the resistance against the establishment! 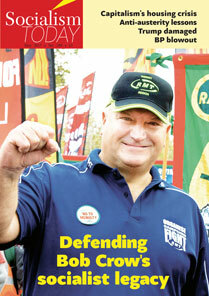 Solidarity with the fighting youth! Let’s unite with the working class forces who have already shown a fantastic solidarity to those campaigning youth and resist the state violence. Imperialism goes more uglier! !Next PostWe were part of the History in the Making!